^ a b 小西友七; 南出康世 (2001-04-25). “Pall Mall”. ジーニアス英和大辞典. ジーニアス. 東京都文京区: 大修館書店 (2011発行). ISBN 978-4469041316. OCLC 47909428. NCID BA51576491. ASIN 4469041319. 全国書誌番号:20398458. ^ a b London Street Atlas. A-Z Street Atlas (8th ed.). Sevenoaks: Geographers' A–Z Map Company Limited. (August 28, 2010) [2008-08-03]. p. 12. ASIN 1843486024. ISBN 978-1-84348-602-2. OCLC 259710758. ^ Weinreb et al. 2008, pp. 619–620. ^ Weinreb et al. 2008, p. 619. ^ a b c Wheatley, Henry Benjamin (1870). Round about Piccadilly and Pall Mall. ^ Pepys, Samuel (2 April 1661). “March 1st”. Diary of Samuel Pepys. ISBN 0-520-22167-2. http://en.wikisource.org/wiki/Diary_of_Samuel_Pepys/1661/April#2nd. "So I [went] into St. James's Park, where I saw the Duke of York playing at Pelemele, the first time that I ever saw the sport." ^ Pepys, Samuel (9 August 1662). “August 19th”. Diary of Samuel Pepys. ISBN 0-520-22167-2. http://en.wikisource.org/wiki/Diary_of_Samuel_Pepys/1662/August#19th. ^ a b Pepys, Samuel (4 July 1665). “July 4th”. Diary of Samuel Pepys. ISBN 0-520-22167-2. http://en.wikisource.org/wiki/Diary_of_Samuel_Pepys/1665/July#4th. ^ John Raithby, ed (1819). “Streets, London and Westminster Act 1662”. Statutes of the Realm: Volume 5: 1628–80: 351–357. http://www.british-history.ac.uk/report.aspx?compid=47305#s3 2013年7月5日閲覧。. ^ a b c d Weinreb et al. 2008, p. 620. ^ Weinreb et al. 2008, pp. 944–5. ^ Weinreb et al. 2008, p. 31. ^ Weinreb et al. 2008, p. 685. ^ Weinreb et al. 2008, p. 27. ^ Weinreb et al. 2008, p. 569. ^ F H W Sheppard, ed (1960). “Plan Pocket”. 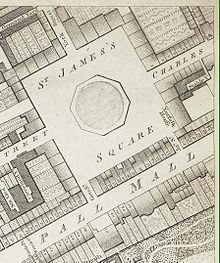 Survey of London (London) 29 and 30, St James Westminster, Part 1. http://www.british-history.ac.uk/survey-london/vols29-30/pt1/plan-pocket 2016年3月18日閲覧。. ^ “The Management of the Crown Estate: Eighth Report of Session 2009”. Treasury Committee. (2009). https://books.google.co.uk/books?id=HLnbNhT8nBwC&pg=PA48. ^ Weinreb et al. 2008, pp. 530–1. ^ Weinreb et al. 2008, pp. 131–2. ^ a b Weinreb et al. 2008, p. 107. ^ MOD 2001, pp. 5–8. ^ Weinreb et al. 2008, p. 826. ^ Weinreb et al. 2008, pp. 107, 710. ^ F H W Sheppard, ed (1960). “Pall Mall, South Side, Existing Buildings: Nos 69–70 Pall Mall”. Survey of London (London) 29–30, St James Westminster, Part 1. http://www.british-history.ac.uk/survey-london/vols29-30/pt1/p425 2016年3月22日閲覧。. ^ Weinreb et al. 2008, p. 621. ^ Thackeray, W. M. (1846). An Irish Sketch Book. http://www.sacred-texts.com/neu/celt/isb/isb01.htm 2016年1月10日閲覧。. ^ Henry Benjamin Wheatley (1870). 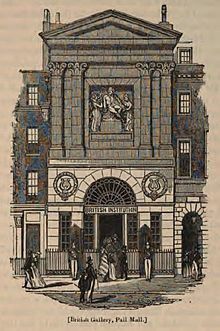 Round about Piccadilly and Pall Mall Or, A Ramble from Haymarket to Hyde Park: Consisting of a Retrospect of the Various Changes that Have Occurred in the Court End of London. Smith, Elder & Company. ^ F H W Sheppard, ed. “Pall Mall, South Side, Past Buildings: The Carlton Club”. Survey of London: Volumes 29 and 30, St James Westminster, Part 1 (London County Council, London, 1960(original); British History Online): 354 - 359. http://www.british-history.ac.uk/survey-london/vols29-30/pt1/pp354-359 2017年10月31日閲覧。. Millar, Andrew (16 July 1765). "I recd all yours wt ye Transactions..." (Letter). Letter to Thomas Cadell（英語版）. Retrieved 3 June 2016. Weinreb, Ben; Hibbert, Christopher; Keay, Julia; Keay, John (2008). “The London Encyclopedia”. The London Encyclopedia. Pan McMillan. ISBN 978-1-4050-4924-5. The Old War Office Building. Ministry of Defence. (2001). https://www.gov.uk/government/uploads/system/uploads/attachment_data/file/49055/old_war_office_build.pdf.